(AKA Identity Crisis) 1985, Starring Robin Ward, Deborah Grover, Antony Parr, Wendy Crewson. Directed by Bruce Pittman. Audiences were outraged when Jeremy Irons failed to garner an Oscar for his portrayal of evil twins in David Cronenberg's arthouse breakthrough Dead Ringers. Strangely, no such outcry occurred three years earlier when veteran Canadian actor Robin Ward played a pair of identical siblings in The Mark of Cain. This Canadian horror thriller directed by Bruce Pittman (Hello Mary Lou: Prom Night 2) doesn't have enough of a script, or a budget, to properly compete with Cronenberg's later films, but it certainly gives them a run for their money in the category of distinctly-Canadian entertainment. Since murdering and crucifying a girl at his family's farmhouse 15 years ago, Michael (Robin Ward, Thrillkill) has been locked away in a mental institution. In order to dispel the bad memories, Michael's twin brother, Sean (Robin Ward, Flick), decides to sell the long-neglected house, and arrives with his wife, Dale (Wendy Crewson, Skullduggery), to try and get the farm in sellable condition. When Sean tells his brother of the plan to put the house up for sale, Michael is none too happy, and has to be calmed by his physician Dr. Clifford (Antony Parr). That night, Michael uses a crucifix to stab a nurse to death and break free from the sanitarium, intent on returning to the farmhouse. Dr. Clifford calls to let Michael know that his brother has gone missing from his room, and that he should keep a sharp lookout. After killing an old man who picked him hitchhiking, Michael arrives at the house and starts terrorizing Dale, the true object of his attention. Michael forces a confrontation by blowing a fuse and luring his brother to the basement for a fight. When the dust settles, Sean hands over an unconscious Michael to be returned to the institution. When Michael awakes with Dr. Clifford, he demands to be taken back to the house because he's really Sean! Dr. Clifford is confused he knows one of the brothers is lying, but which one? The Mark of Cain takes quite a while to get around to the expected twin confusion plot point, so it's a bit disappointing when the film really has trouble knowing where to go from there. Generally, Pittman shows a steadier hand here than he did on his only other foray into Canadian horror, Hello Mary Lou: Prom Night 2, even though this later sequel is ultimately a more enjoyable film. Despite its flaws, The Mark of Cain manages to hit on two of the common threads in Canadian horrorCatholicism and the failure of health care institutions. Admittedly, it doesn't handle the religious angle very well. There is a great deal of Catholic imagery woven throughout the film, as well as some more mysterious satanic undertones, but neither is properly addressed to give these aspects of the plot much importance. More noteworthy is the failure of the sanitarium to stop abuses from inside its walls. Here, the Dead Ringers comparison becomes a little more relevant, although this film opts to show how a patient has manipulated the system to his own benefit. 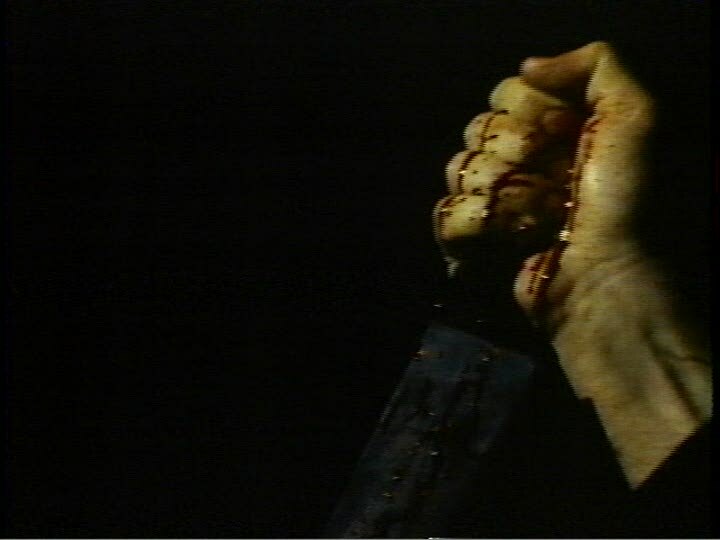 In this way, The Mark of Cain leans a little closer to Jerry Ciccoritti's Psycho Girls, which features a hospital breakout by yet another mentally deranged killer. Although not a twin, the twisted sister at the centre of Ciccoritti's film looks enough like her sibling to get away with taking some party-goers back to the hospital for a night of torture. Both films play off of fears that psychotic individuals can exploit a system blindly controlled by the Government, and hark back to embarrassing incidents in Canada's past. However, while Psycho Girls succeeds because it is tongue-and-cheek and extremely playful with the script, The Mark of Cain doesn't, because it takes itself far too seriously. There's very little action, as melodramatic drawing room conversations are the only real device the film has at its disposal to keep the plot chugging along. One of the most curious things about this picture is that it seems to be heavily influenced by Canadian horror's heavy hitter, Black Christmas. 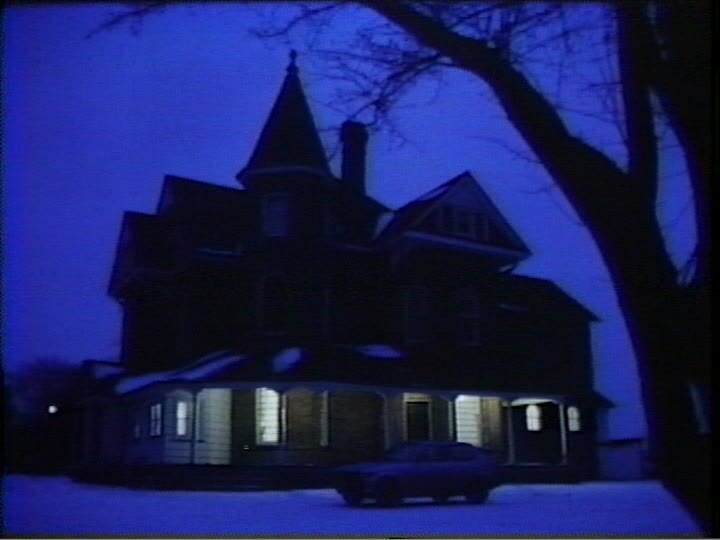 A similar atmosphere is employed by Pittman, with a creepy old mansion, jangly, threatening phone calls, and an unknown lurker somewhere in the house. The very first murder bares an uncanny resemblance to Billy's stabbing of a co-ed with the business end of a glass unicorn, in both subject and technique with quick editing that hides all the gory details. While neither a particularly noteworthy Canadian, or horror, film, The Mark of Cain does have a few mildly interesting things going for it. Robin Ward's double performance is ambitious, and the seeming nods to previous Canuxploitation films are well-noted. 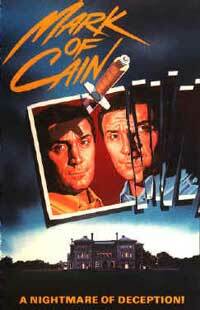 Unfortunately, The Mark of Cain is a little behind its time, and comes off as a stagey horror without much of a punch.